Fr. 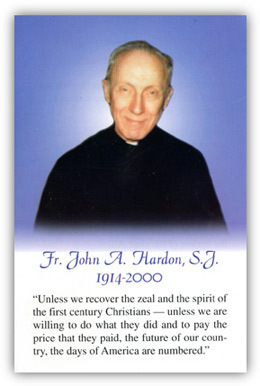 John A. Hardon served as the Northwest Catholic Family Education Conference's spiritual director from its founding in 1994 until 2000. He supported and encouraged Catholic home-educating families and spoke at numerous conferences, inspiring parents to live holy lives. The cause for Fr. Hardon's beatification began in 2006. Please join us in praying for his glorification. the honors of the altar. Amen. "In the ordinary course of Providence, God uses as His instruments those who are personally most united to Him by their virtue, who are most humble and patient and pure and prayerful."